The Carina Nebula, one of the largest and brightest nebulae in the night sky, has been beautifully imaged by ESO’s VISTA telescope at the Paranal Observatory in Chile. 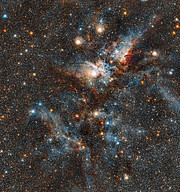 By observing in infrared light, VISTA has peered through the hot gas and dark dust enshrouding the nebula to show us myriad stars, both newborn and in their death throes. About 7500 light-years away, in the constellation of Carina, lies a nebula within which stars form and perish side-by-side. Shaped by these dramatic events, the Carina Nebula is a dynamic, evolving cloud of thinly spread interstellar gas and dust. The massive stars in the interior of this cosmic bubble emit intense radiation that causes the surrounding gas to glow. By contrast, other regions of the nebula contain dark pillars of dust cloaking newborn stars. 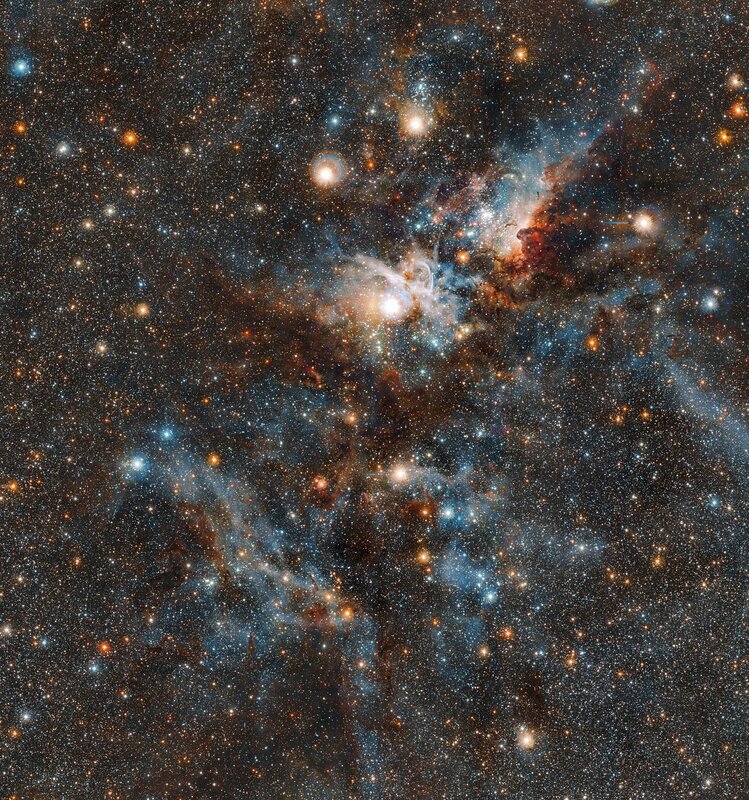 There’s a battle raging between stars and dust in the Carina Nebula, and the newly formed stars are winning — they produce high-energy radiation and stellar winds which evaporate and disperse the dusty stellar nurseries in which they formed. Spanning over 300 light-years, the Carina Nebula is one of the Milky Way's largest star-forming regions and is easily visible to the unaided eye under dark skies. Unfortunately for those of us living in the north, it lies 60 degrees below the celestial equator, so is visible only from the Southern Hemisphere. Within this intriguing nebula, Eta Carinae takes pride of place as the most peculiar star system. This stellar behemoth — a curious form of stellar binary— is the most energetic star system in this region and was one of the brightest objects in the sky in the 1830s. It has since faded dramatically and is reaching the end of its life, but remains one of the most massive and luminous star systems in the Milky Way. 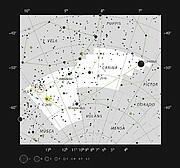 Eta Carinae can be seen in this image as part of the bright patch of light just above the point of the “V” shape made by the dust clouds. Directly to the right of Eta Carinae is the relatively small Keyhole Nebula — a small, dense cloud of cold molecules and gas within the Carina Nebula — which hosts several massive stars, and whose appearance has also changed drastically over recent centuries. The Carina Nebula was discovered from the Cape of Good Hope by Nicolas Louis de Lacaille in the 1750s and a huge number of images have been taken of it since then. 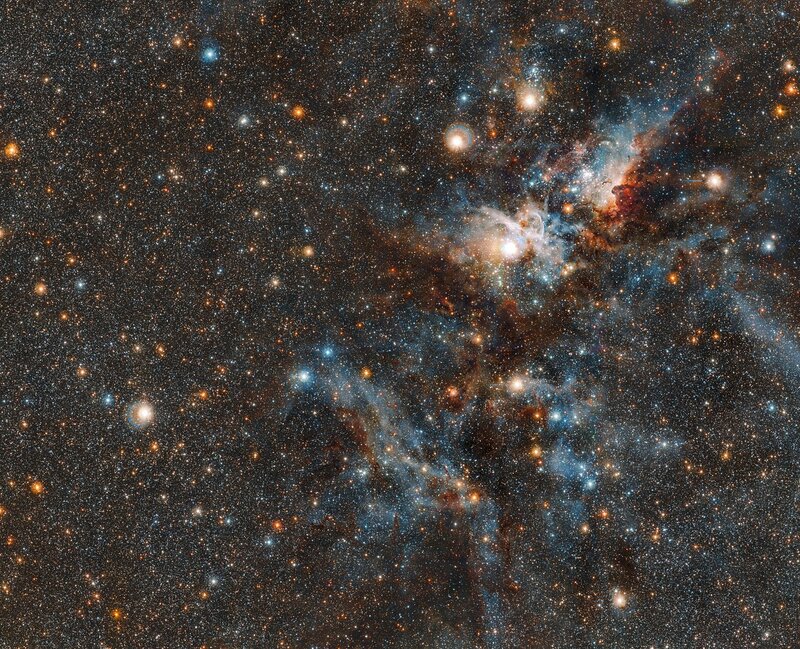 But VISTA — the Visible and Infrared Survey Telescope for Astronomy — adds an unprecedentedly detailed view over a large area; its infrared vision is perfect for revealing the agglomerations of young stars hidden within the dusty material snaking through the Carina Nebula. 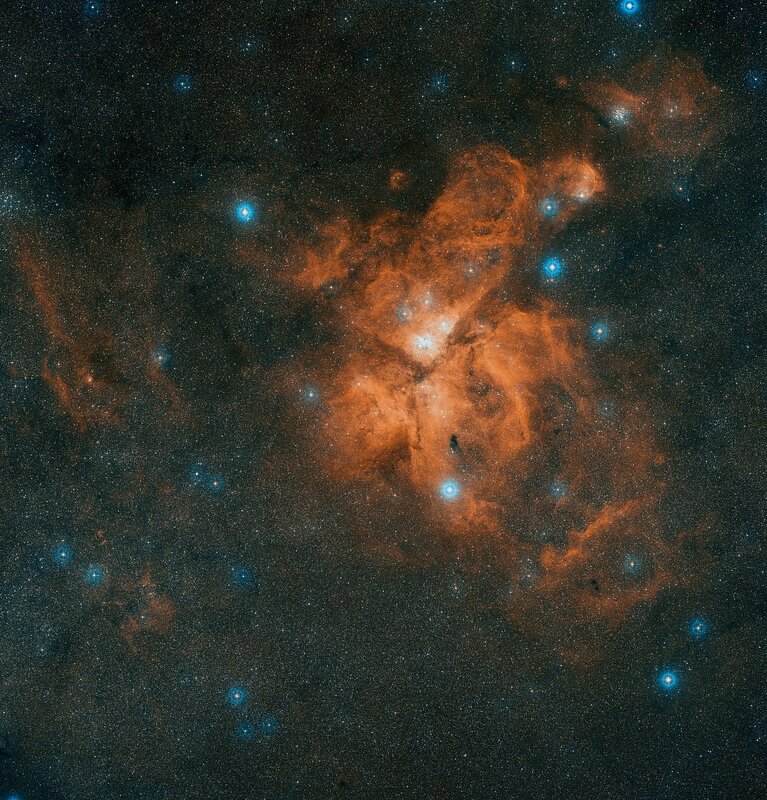 In 2014, VISTA was used to pinpoint nearly five million individual sources of infrared light within this nebula, revealing the vast extent of this stellar breeding ground. VISTA is the world’s largest infrared telescope dedicated to surveys and its large mirror, wide field of view and exquisitely sensitive detectors enable astronomers  to unveil a completely new view of the southern sky. The Principal Investigator of the observing proposal which led to this spectacular image was Jim Emerson (School of Physics & Astronomy, Queen Mary University of London, UK). His collaborators were Simon Hodgkin and Mike Irwin (Cambridge Astronomical Survey Unit, Cambridge University, UK). The data reduction was performed by Mike Irwin and Jim Lewis (Cambridge Astronomical Survey Unit, Cambridge University, UK).